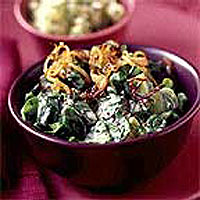 In this dish, the mustardy flavour and robust texture of winter greens is softened with coconut cream and warmed with Indian spicing. This is great as part of a vegetarian meal, served with a full supporting cast of chapatis, rice, raita and dhal. Heat 1 tbsp of the ghee or oil in a pan over a medium-low heat and gently fry the onion until lightly caramelised. Sprinkle with a pinch of salt and the mustard seeds and fry a little longer to release the fragrant mustard oils. Set aside and keep warm. Heat the remaining ghee or oil in a large, heavy pan over a medium-low heat. Gently fry the chilli for a few moments, then add the greens. Salt lightly, cover and cook, stirring occasionally, for 5 minutes or until the leaves wilt. Add the coconut cream and simmer for a few minutes until the greens absorb most of the cream and the whole mixture is piping hot. Heap the coconut-flavoured greens in a dish and serve them topped with the caramelised onions. This is also excellent accompanied by a fresh apple-and-mint chutney, which you can make by simply putting 2 peeled and quartered apples, a generous handful of mint, half a roughly chopped onion, and a squeeze of lemon juice in a processor and blitzing to a rough purée.